Couture Carrie: Biore Mask Giveaway! Darlings, time to get gorgeous with Biore's Self-Heating One Minute Mask! 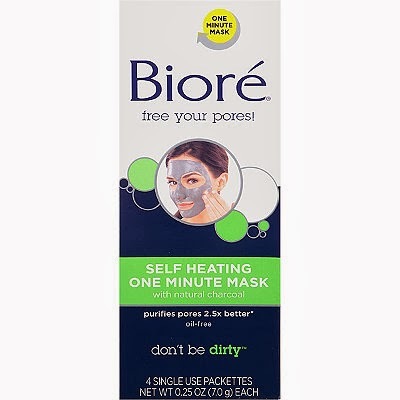 About Bioré Self Heating One Minute Mask ($7.99): In just one minute, this thermal mask warms to open pores, draws out anddissolves 2.5 times more dirt, oil, and surface toxins than a basic cleanser, and rinses them clean away with an invigorating cooling sensation. Infused with natural charcoal, this breakthrough mask melts dirt and oil better than the leading competitive mask. So clean your pores from the dirt, oil and makeup of the past and clear the problem. Available at drugstores nationwide - www.biore.com. Fabulous news, darlings! CC and Biore have three (3) of these amazing masks to give away to three (3) lucky Couture Carrie readers! Five Day Giveaway: To enter, simply leave a relevant comment on this post. Good luck and stay gorgeous, darlings! Ooh, I love that this is Self Heating - I want! I can imagine this lovely face mask on me while I'm in the house relaxing reading blogs and stuff lol. Good luck with everything! This sounds wonderful! Thank you so much for the chance to win.